I work with a young woman who is a BIG fan of meal prepping. She puts together lunches for the whole week on Sunday evening. She even has specially purchased plastic containers for the purpose. I've never been willing to sacrifice the amount of time needed to cook and assemble the meals during my son's naps. But I'm also getting so sick of eating crap: processed packaged foods. So the goal is more variety, healthier food (not healthy healthy necessarily but not frozen or freeze dried crap), and hopefully saving a little money. 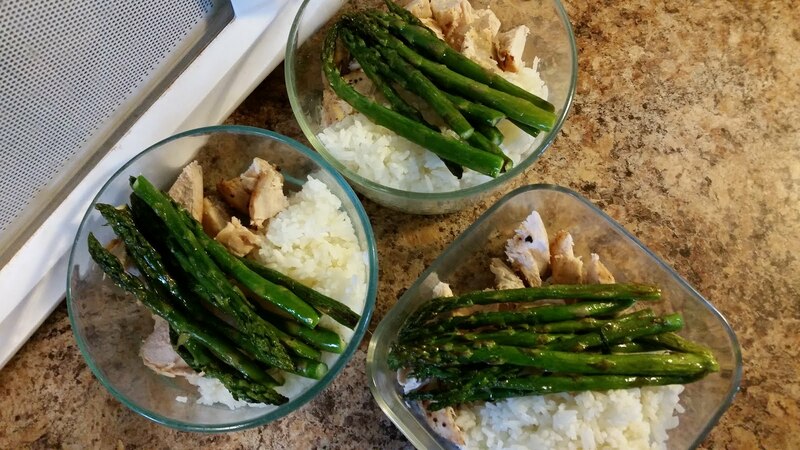 With that in mind I started small, two marinated chicken breasts, one bundle of fresh asparagus, and white rice (from the cupboard). I broiled the chicken according to the package/internet directions, adding as much as 6-8 additional minutes to avoid any potential RAWNESS. This was the first time I'd ever cooked chicken, so I was a little stressed. Then I baked the asparagus with olive oil and salt, while cooking the white rice on the stovetop. Now this all may sound very simple, but keep in mind I've never cooked anything more complicated than boiling water for pasta. I ate the first one for lunch today and it was yummy. Success!